Koike High Carbon Circle Hooks are a high quality full circle hook. 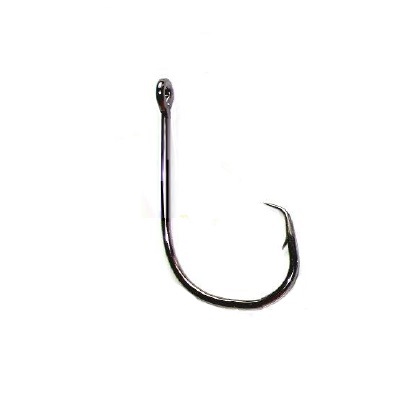 This type of hook is becoming increasingly popular throughout the UK due to the unique self-hooking properties this pattern offers. Commercial long-line fishermen who set thousands of baited hooks in the sea and need fish to become self-hooked have used circle hooks for decades. This has transferred to shore angling where circle hooks are used in the same way – once a bite registers anglers simply have to give the fish time to take the bait into its mouth and then reel in (importantly without striking) and the fish will hook itself on the turned in point of the circle hook. Furthermore, as the circle hook slides to the edge of the mouth of the fish before it sets it means that the vast majority (90%+) of fish caught with circle hooks are lip hooked – great for catch and release fishing. These circle hooks from Koike are chemically sharpened, made with a very high carbon content and have a dark nickel finish. Sold in packets containing ten hooks with a choice of four sizes available.